Feeling confident in the way that you look is easier said than done but each one of us has a reason to feel beautiful. What is that reason? You are already beautiful! Every single one of us is beautiful in our own way. No matter what you look like or any of the things that you usually worry about, you need to remember that you can be pretty like you, not like someone else. Even the most objectively attractive people can feel like they're not good enough at times & I think that social media has a lot to answer for in this respect. Sometimes it can be really difficult to look in the mirror & not start picking out all of your flaws or take a selfie & not Facetune it to death. But the more comfortable you become with your appearance, the more confident you will appear to others. 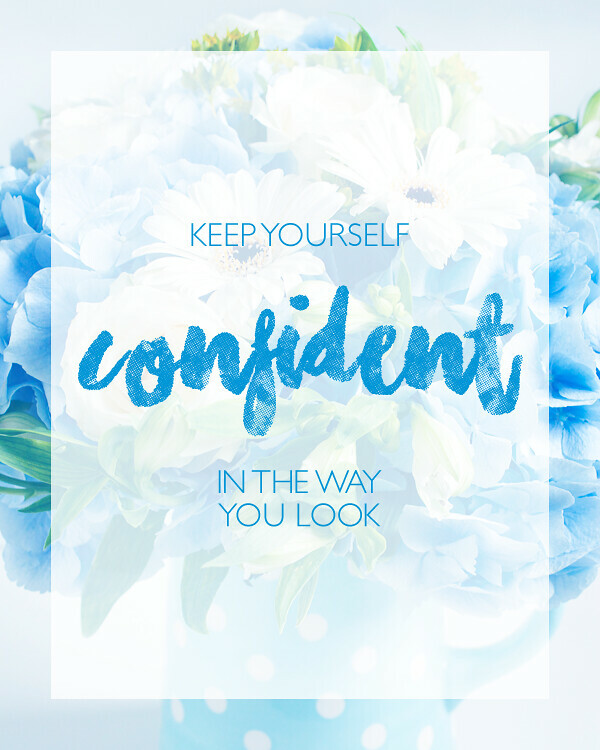 So if you're looking for ways to get this feeling of confidence, here are some ideas to help you out! Comparison truly is the thief of joy & at times comparing myself to others has really knocked my confidence. Instagram can be a great place to get beauty & fashion inspiration but scrolling through your feed can also be a very toxic way to spend your time. You might be feeling perfectly fine until you come across someone with perfectly clear skin or an impossibly skinny waist & wonder why you can't look the same way. This train of thought can really damage your mental health & possibly lead to disordered eating, wasting money on cosmetic procedures or using apps to make yourself look unrecognisable. Chances are that the people you envy on Instagram don't look that way in real life either & the manipulation of photos can manipulate your sense of self. If using social media is making you feel so awful about your natural appearance you need to just delete the apps for a few days & stop engaging with that content. Don't follow people who make you feel bad about yourself & don't let what other people are doing affect you. Learning to love yourself can take a long time but it can hugely boost your confidence. There are lots of simple ways you can practice self love, some of which can be done on a daily basis. Taking care of yourself shows the rest of the world how you deserve to be treated. Being kind to yourself about your appearance is pivotal to your own happiness & when you feel happy, you'll feel more confident too. It's easy to focus on the things that we dislike about our appearance so take the time to appreciate the things that you do like. Maybe your skin is looking really clear or your nails are long & strong. Write a list of these qualities that you can read whenever you need a quick pick me up. Learn to cherish all the things that your body does. Sure your arms might be a little flabby but they allow you to hug people, draw, write & carry things. You might not have a thigh gap but you can dance, run, jump & skip with your legs. Our bodies allow us to do so much & should be treated with respect, not self-loathing. We can be so harsh on ourselves that it verges on bullying & it's vital to take the time to fight this negative self talk. One of the most important things you can do is ensure that you are getting enough sleep! It doesn't matter what your reasons are or how difficult you find it to get to sleep, it is essential that you get the rest your body needs. When you do this, you will find that you wake up feeling refreshed & your skin looks better than it has done in ages. Once you notice this, you are immediately going to feel far more confident in the way that you appear & that's just the start of it! If you do have trouble getting the right amount of sleep, there are a few hacks that you can try. Having a warm drink before bed, taking magnesium supplements or diffusing lavender oil in the bedroom can all help to promote natural sleep. Another helpful tip is to remove all the electronics from your bedroom so that the blue light doesn't disturb you. You might be thinking that you don't have a blue light but this is something that your electronic devices are constantly emitting which has been linked to difficulty sleeping. As such, this little trick is well worthing trying if you are trying to get the recommended hours of sleep in! Another thing that you should look at is your smile. It might be the case that you already love the way you look when you are smiling, a lot of people do because that's when we all look our best. It really is true to say that nobody looks better than when they have a smile on their face! But for some, they just don't feel confident in the way they appear. In fact I never smile with my mouth open in photos because I don't want people to judge me for having crooked teeth. Like I said, self love can be difficult & my teeth are the thing I struggle with most of all. That is where a company like Instasmile can help you. Providing you with the perfect smile is what a service like this can do for you, which will do wonders for boosting your confidence. You might not realise it now but once you feel beautiful when you are smiling, you are going to radiate confidence & the whole world is going to look at you in a different light! Finally, keeping fit is an excellent way to ensure that you feel good about the way you look. It doesn't have to be about weight loss, going to the gym is also fantastic for your mental health. When you exercise, the sweat clears out your pores giving you that refreshed glow that people are always talking about. But you will also notice that you start to look at yourself differently. It only takes eight weeks to see a difference & if you want to feel confident, you should certainly consider hitting the gym to tone up. I love the way that exercising makes me feel. I'm addicted to the rush of endorphins I get after a Body Pump class. I enjoy being able to lift heavier weights & pushing my body to do different things. I like that sense of fatigue in my muscles & being able to feel a little bit more muscle definition each week. Even gentler classes like yoga & pilates can have a strong impact on your body. I hardly ever run on a treadmill because it doesn't make me feel good about myself. Exercise should be something that you enjoy & when you start noticing those small changes in your body, your confidence levels will skyrocket.